"This tasty salad with Japanese buckwheat noodles is both quick and healthy; great for lunch or dinner. 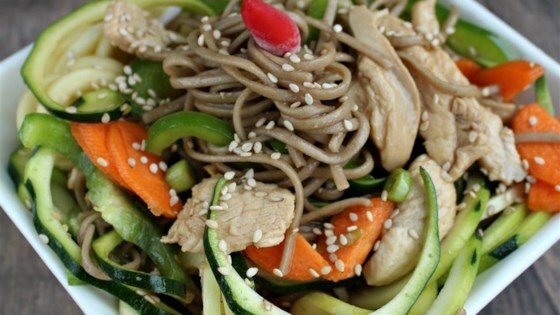 Most larger supermarkets have buckwheat soba noodles in the Asian food section." Whisk rice vinegar, 1 tablespoon vegetable oil, sesame oil, brown sugar, soy sauce, and ginger together in a large bowl until dressing is combined. Bring water to a boil in a large pot. Add soba noodles, stir, and return water to a boil. Boil noodles until tender, 4 to 5 minutes. Drain noodles in a colander under cold running water until cool, about 1 minute. Heat 2 teaspoons vegetable oil in a skillet over medium heat. Cook chicken breast pieces until no longer pink in the center and the juices run clear, 2 to 4 minutes. Add garlic, salt, and pepper; stir until fragrant, about 1 minute more. Toss soba noodles, chicken, celery, carrot, red pepper, cilantro, green onion, and sesame seeds together with dressing in large bowl. A healthy and colorful Asian flavor-inspired meal. I use yamaimo soba, a buckwheat soba that contains yamaimo, a japanese mountain yam. It was excellent....I left out the sugar...no need for it and added some red pepper flakes. Super easy, healthy and quick! I took out the sesame due to allergies in the house, and it was fine with only 1 tbsp olive oil. I added 1/2 cup cooked edamame, and used shrimp instead of chicken. It made a great cold lunch! Worked well as written. I skipped the celery too, and added blanched broccoli.